The Brooks Addiction is similar to the Beast in that it is wide, deep and very stable which is good for heavy pronators. Recently the Addiction 8 was released and it is a significantly different shoe than the Addiction 7. Toebox Length and Depth – Substantially longer toebox in the Addiction 8 vs. the 7. 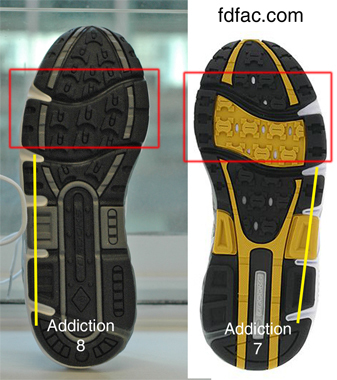 This may be good or bad depending on whether your heel to ball or heel to toe measurement is longer https://drshoe.wordpress.com/2007/12/05/size-matters-heel-to-ball-vs-heel-to-toe/ The toebox depth in the Addiction 7 is much deeper than in the 8, or put differently, the 7 has more overall volume than the 8. Width and Outsole Shape – The Addiction 8 is much narrower and has a much straighter last than the Addiction 7. If you have been successfully wearing the 7 you may need to go wider in the 8. Overall, I’m pleased with the changes and much prefer version 8. It is more streamlined and proportional to the average foot than then 7. If however you have short toes, then you may want to try the Brooks Dyad, which has a shorter toebox than the newer Addiction 8. This entry was posted in Orthotic Friendly Shoes, Shoe Fit, Shoe Review, Sport Specific Shoes. Bookmark the permalink. I have to admit the 8 has given me nothing but grief. I ran in the 7’s for about 3 years and then was forced to change when the 8’s arrive. Now I’m constantly getting blisters – something I’ve never had problems with before. I’ve suspected it might be something with the toe box and based upon what you’ve written it looks like that indeed may be the culprit. thanks for the review! I’ve really been struggling since they changed the design from 7 to 8. I’d worn the 7 since 2003 with great success. The 8s didn’t work for me, so I tried different shoes. I think I’ll try to go back to the Addiction and get a “wide”. Your reviews are very informative, and you’re right. The 8 is very much narrower than the 7. I’ve worn a 7 size 9.5D for the past 2 years. My toes would swim in those. I purchased the 8 size 9.5B thinking that the 9.5D would still be too roomy in the toebox area. It turned out the 9.5B was much too tight. What a huge size/design change! 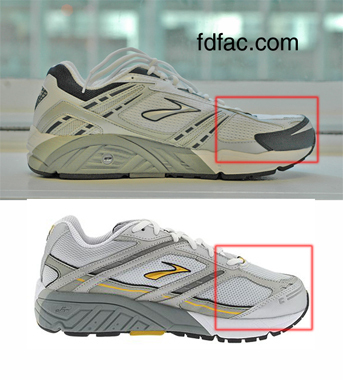 Manufacturers should be more consistent fit-wise when they update their shoe line. Through Zappos I got the 8 size 9.5D. It fits much better than the 7 size 9.5D. Unfortunately, in the 8, my toes occasionally hit the front end, esp. when I change directions abruptly, such as when I play with my dog. For normal running, typically 20 miles per week, I feel fine. The shoe is well made, and I would consider buying the 8 again, but I would need to choose between the 10D or 10B.